Tags: idle, champions, early, access, update, time gates. 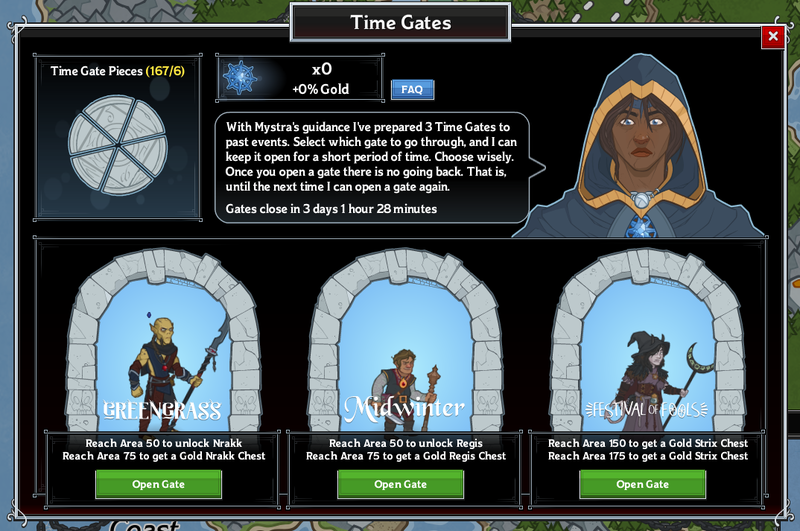 Looking for more information about our new Time Gates feature that wasn't covered in our Dev Blog: Introducing Time Gates? Check out our FAQ below! Q: What are the Time Gates? A: Long ago, there were ways to travel through time within Toril. These portals, or Time Gates as they were known, were powerful creations of magic that have become lost to time. Mystra, the goddess of magic, has foreseen great challenges coming for the champions and has granted one of her chosen, Kaylaar, the power to open Time Gates to assist you in your quests. Q: OK, so that's the lore-filled explanation. But what does that really mean? A: Time Gates are a new feature for Idle Champions of the Forgotten Realms. They are the avenue by which you can earn champions from previous events that you may have missed, and/or gear them up for free. Every time a Time Gate is available, you'll be able to choose from one of three previous event champions. Once you open the Time Gate to that champion, you'll be able to replay the event adventure they are tied to, and collect up to 2 gold chests for the champion. If you haven't unlocked the champion, you'll also earn that champion on your first Area 50 completion. Q: My Time Gate has different champions available than my friend's Time Gate. Is that a bug? A: No. The champions for each player are randomly chosen based on the champions they have collected already. If possible, there will always be at least one Champion you haven't unlocked available through the Time Gates. Q: What do I have to do to collect the displayed Time Gate rewards? A: The first time you select any given champion through the time gate, you'll need to complete two runs to collect the rewards: one to area 50, and one to area 75. Q: I just triggered a Time Gate and the areas I have to reach are higher than 50 & 75. Why is that? A: The first time you select a champion, the areas you have to reach are 50 & 75. The next time that champion is available within a Time Gate, the target areas are increased for each reward previously claimed, so you'll have to get to areas 100 & 125. This effect stacks if you continue to choose the same Champion each time they're available, making their rewards harder and harder to get. However, if you don't choose that champion when it's available, the *next* time that champion because available the required levels will drop by 25 (to a minimum of 50 & 75). Q: How often are Time Gates available? A: Natural Time Gates will be opened by Kaylaar approximately every 3 weeks (give or take). But you can open them (with her assistance) on your own once you've collected enough Time Gate Pieces. Q: What are Time Gate Pieces? A: Bosses will now begin dropping Time Gate Pieces. These are extremely rare drops which do have a cooldown, so farming bosses will not increase your drop rate. Once you collect 6 of those pieces, you can ask Kaylaar to open a Time Gate outside of the normal event window. You won't be able to open one is if she's going to open one on her own within 72 hours, or if you already have a Time Gate open. Q: How long are Time Gates open for? A: Time Gates will normally be available for only 72 hours, whether they are opened through the normal event cadence or through your collected Time Gate pieces. However, for the first Time Gate, we're opening it for an additional few hours to make sure everyone has plenty of time to play in the first window. Q: Do I gain divine favor during a Time Gate event? A: Yes, you gain favor with Mystra, and you'll be forced to convert it once the Time Gate closes, just like normal events, although the conversion ratio is smaller than normal events. Q: If I decide I don't want to collect the champion I chose, can I choose a different champion? A: No. Once you select the champion during a Time Gate window, you can't change your decision. Q: I opened the time gate, but I didn't complete the 2 runs. What happens? A: For each reward that you were not able to collect we credit your account with a Time Gate piece when the gate closes, which is 1/6th of another Time Gate run. So if a Time Gate becomes available and you chose a champion, but you are unable to complete any of the objectives, you'll find 2 additional Time Gate pieces in your inventory when the Time Gate closes. Q: Who is the woman controlling the Time Gates? Is that Mystra? A: No. That is Kaylaar Allun, a powerful wizard and a chosen of Mystra. She has reached out to the champions under the bidding of her goddess, Mystra. Tags: idle, champions, early, access, update, tomb of annihilation. After the defeat of the warlord Ras Nsi and his followers the party begins making final preparations to depart the Lost City of Omu and descend into the deadly tombs below. Beneath the fallen kingdom, the souls of the dead are being stolen by a necromantic artifact in order to feed the hunger of a malignant, otherworldly threat. The time has come to brave the Tomb of the Nine Gods and end the death curse once and for all. Today's update brings an epic conclusion to the Tomb of Annihilation storyline with two new adventures, A Grand Puzzle and The Tomb of the Nine Gods. These adventures conclude the main storyline of this campaign, but don't worry – there will be more side-quests and variants to come, so don't stop earning favor with Kelemvor! Note: To start these new adventures, you need to have completed the Captured! adventure. One of your companions reveals that they have been afflicted by the Death Curse, and it's a race against time to discover the secret to gain entry into the Tomb of the Nine Gods and save them. Desperate to save the souls trapped in the Soulmonger, the party descends below Omu to confront the powerful lich Acererak. Added two new Tomb of Annihilation adventures: A Grand Puzzle and The Tomb of the Nine Gods. In order to start these new adventures, you will need to have completed the Captured! adventure. BW2: Patriot Event 2018 Edition! Tags: bw2, patriots, 2018, update, event. It's party time in the Commons! Come join in the fun as the Bushwhackian natives celebrate Canada Day and Independence Day with a big extravagant barbecue and endless displays of fireworks! Collect hot dogs, hamburgers, chickens, ribs and the rare steak to grill up for Patriot tokens and bonus energy! Find the green, red, yellow, blue and rare purple fireworks from the bushes for Fiona to put on awesome displays! As well, help assorted party guests with their quests to make their celebration even funner! Some are one part, some are multi-part that will unlock as the event goes on so check back daily for all the excitement! First up, help Scoutmaster Sam find Globes today, so that she can see the glorious world of Bushwhackia in its entirety. The Canada 150th quest line has been updated to be a generic Canadian anniversary themed event. If you've already unlocked the Canoe mount, then this year you get a yummy treat when you complete it instead. There are 8 quests and one unlocks every day at Noon Pacific Time, starting tomorrow, Saturday June 23rd. If you have already collected every Fireworks launcher piece, then talk to Fiona on June 30th to get your fireworks launcher related achievements. There are a total of 18 possible achievements to earn in the Patriot Event 2018. Iron Chef - Cook 300 pieces of food during the event. Many Booms - You've set of 600 fireworks during the Patriot event. The Tyrant - You overthrew Nate's illegitimate kingdom. Patriot Fireworks Launcher - You crafted a Fireworks Launcher! Patriot Fireworks Launcher Rare - You found a Rare addition for your Fireworks Launcher! Patriot Fireworks Launcher All Rares - You found all the Rare additions for your Fireworks Launcher! Sesquicentennial - Help Connie the Canadian and make full use of a Free Parks Pass. *If you are having trouble finding the Steak, you can buy it for Celebration tokens from an NPC in the Commons. **The 6th firework for the quest is the one you help an NPC build later in the event. As well, if you are having trouble finding the Purple firework, you can buy it for Celebration tokens from an NPC in the event area. National Acquirer - You bought all the 2017 Patriot event items! Patriotic Purchases - You bought all the 2016 Patriot event items! Celebratory Splurge - You bought all the 2015 Patriot event items! Freedom's Price - Purchase all of the 2014 Patriot custom items. Freedom of Purchases - Purchase all of the 2013 Patriot event items. Dressed for Freedom - Buy all 6 player items from the 2012 Patriot event. A Patriotic Pad - Buy all 7 house items from the 2012 Patriot event. ***The Patriot event mini-golf piece is not required for the Free Trade achievement. Post your celebrations on the forums! The event will run until Friday July 6th at Noon PDT! Where can I see how much meat and fireworks I've done for the achievements? Click on the inventory icon and then click on the Achievements list (gold star). Find Many Booms and Iron Chef to see your progress. There are two vendors. The one near the entrance of the Event Zone has this year's items. The other is under the American balloon arch and will have all previous year items for Bush Bucks. Turning in the meats and fireworks as well as quests for the folks in the event area. Tags: bw2, weekend, mini quest, june, zepplin, 2018. There's a visitor in the Commons that could use a hand! Be sure to chat with them for a limited time opportunity. Be quick, as they're only staying till Noon Pacific on Monday June 18th. This weekend we're also running a Pet/Mount Sale and a Bush Buck Sale! Grab those cute little friends you've been missing! Plus, for a limited time only you can get a Steampunk themed mount with your first purchase of 100 Bush Bucks or more!